Susan M. Rostan is a visual artist, educational researcher, and the author of Digging: Lifting the Memorable from Within the Unthinkable, a work of creative nonfiction. She has written well-received articles in The Journal of Creative Behavior and Creativity Research Journal as well as chapters in diverse books on creativity. She has an MFA from Long Island University and a doctorate in gifted education from Columbia University. 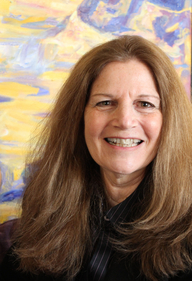 Ms Rostan has directed the Rostan Art School since 1970, conducted extensive research in children's artistic development, and has served as an adjunct professor in Hofstra University's School of Education. Ms Rostan and her husband Robert live on Long Island. 1. What has been the most challenging part of publishing for you? A. Although the design and production of the book was the most challenging part of publishing, this does not mean that it was not an enjoyable and satisfying experience. Even the taxing and tedious processes of editing and proofing the manuscript offered a richer understanding of what it means to prepare creative work for an audience. Each aspect of the publishing process helped me bring my vision of what the book should look like, and the kind of reader experience it should engender, to fruition. As a painter, I encounter these kinds of challenges as I create and re-create visual passages; challenges are an inherent part of my creative experiences. 2. Why did you decide to publish your work? A. The work arose as an illuminating intersection of my genealogical research and my artistic enterprises. When I encountered significant obstacles in my search for my husband’s ancestors, I began to shift my attention from archived documents to archived memories and the images and possibilities they offered in telling a story that I was just beginning to understand. With an emerging desire to share my ruminations, I gave my early readers chapters to read, hoping they would enjoy what I was learning and experiencing. I began to hear that my readers found the story compelling, and that each reader found something particularly meaningful, understanding the story and the characters in relationship to their own lives, and the lives of their own families. What began as an attempt to discover and preserve the hidden and lost legacies of my husband’s family – a family we had believed would be forever lost to us — evolved into a story about love, laughter, friendship, and sacrifice for all of us. 1. What has worked best for you? A. Social media offers me opportunities to interact with my audiences and I enjoy the dialogue it encourages. I am learning more about the impact the book has on its readers, and how to continue to engage my readers, even as I work on new stories. 1. What inspired you to write your story? A. For many of us, there comes a moment in our busy, yet comfortable lives, when something changes – when the world before us suddenly offers a new perspective, a compelling choice. For me, one of those moments came on a quiet afternoon as I watched my granddaughter Ella digging. A budding genealogist, I had just put aside my own parents’ family tree and turned to my husband’s family, hoping to go back a few generations. This, I was finding, was an exercise in futility. My husband knew very little about his ancestors, or about the family members who had died at the hands of the Nazis. My mother-in-law Elzbieta and her brother Marian, both survivors of the Warsaw Ghetto, never spoke about their lives in Poland and my husband grew up knowing that this was not a topic for conversation or inquiry. I grasped this rule, having witnessed the consequences of breaking it when a relative asked Marian about her own family’s history, unleashing his explosive anger and pain, with few answers to speak of. With my mother-in-law’s passing, Marian alone could share his story and, along with it, his family’s history. Nevertheless, I could not bring myself to question Marian, even as I sat with my own sadness and resignation. Ella’s digging inspired me to engage Marian and learn about his family, about Ella’s namesake Elzbieta. Ella was sitting in my yard digging alongside our puppy LJ and a little earthworm. LJ was attempting to unearth a buried object, casting dirt and debris in all directions, while Ella was carefully removing vegetation, transplanting it, and feeding it to the busy earthworm. The activities unfolding before me gave me the insight I desperately needed: if I am careful and considerate, my own can be undamaging, fruitful, if not beneficial. I would learn that beyond these goals, it was necessary. 2. Tell us about your writing process, do you write plot first and then add characters or do you develop your characters first? Do you have any quirks when writing like you have to have one cup of coffee first or you can’t write until the first paragraph is written … etc.? A. I typically begin with a scene that has a visual richness that includes layers of content and understandings that I can flesh out and explore. Interactions with people have always stimulated my writing; some precious happenings engender images, elicit memories, and generate ideas. The ruminations that occur in the aftermath of an experience incite my writing. My day begins with an early morning walk with my black lab LJ. While LJ sniffs his way around our neighborhood, I allow myself to ponder images and their emotional content that have made their way into my morning musings. I explore the meanings that emerge from these contemplations for consequences and back-stories, and usually arrive home with a narrative to create and the energy required for the work. This process is not very different from my experiences as a painter, standing before my canvas. Using paint as a medium for self-expression, I typically find myself putting colors down on canvas – interacting colors applied with large brushes and thick, excitable paint – as I imagine conversations that I may have had or witnessed, or that I imagine occurring. With written language as my medium, I begin by noting salient ideas and using words to describe people and emotionally packed situations. This may happen even as I am relishing the experience, or grasping the meaning of the encounter, as it happens. My mind and writing process brims with conversations held in different languages: paint, color, mathematics, words, and emotions. My writing is a dynamic, multidimensional canvas craving interactions with the world. 3. What do you want readers to get out of your story? A. Each of us has a personal story that resonates with others because of the humanity it exposes, encouraging us to appreciate, critically analyze, or simply empathize. My story includes testimonies to the lost lives of victims of the Holocaust, the hidden lives of the survivors, and the heroism of the people who risked their lives to save another. It is a journey into a perspective of life much broader, deeper, and more precarious than many of us experience. Along with the emotional and intellective experiences, I hope my readers will close the book understanding that more often than not, it is not too late to do the right thing and that sometimes doing the right thing is a simple gesture with unforeseen beneficial consequences. 4. What has been the most rewarding part of your writing adventure? A. Beyond finding the right words to express myself, it has been immensely rewarding to find the story having a significant emotional and intellective impact upon others. This applies to the people involved in the story, those people who were unknowingly, tangentially involved in the story, as well as my readers. In the process of identifying and locating the living relatives of the brave, self-sacrificing people who had rescued my husband’s family, I became acutely aware of how my research had changed their lives. It brought a story of heroism to the name of an ancestor, and rekindled a connection between generations of families brought together by circumstances and war. Playing a part in identifying, nominating, and formally recognizing people as Righteous Among the Nations, the title Yad Vashem bestows upon non-Jewish rescuers of Jews during WWII, was an awesome and gratifying outcome of my writing adventure.